My biggest dream in life has always been to work for the Walt Disney Company, and during the Spring 2017 semester that dream has become a reality while I’ve been taking part in the Disney College Program! 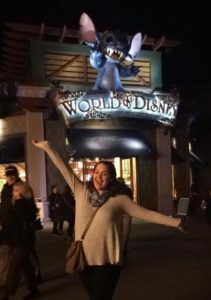 The Disney College Program is an internship program that Disney runs as a way for college students to work for the company while also taking part in seminars, events, and other networking opportunities. For many students, the program serves as a great first step with the company and helps to provide the experience and contacts necessary to move forward with other internships and positions within the company. 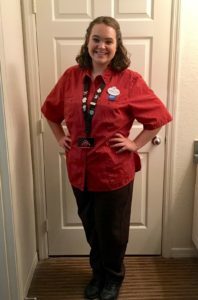 When I was accepted into the program, I was offered a merchandise position and have spent the past few months making magic at World of Disney, the largest Disney retail location in the world! As someone who wants to pursue a design career in the advertising field, this merchandise position has been a perfect fit for me. While I’ve been working here, I’ve have the chance to really pay attention to the different ways that Disney does marketing from a retail perspective and have been able to take note of how well different design choices work, with the hopes of carrying that information into my own work in the future. If I’m not at work, I’m usually at one of the parks trying to fully experience things from a guest point of view. One of the most important aspects of working for Disney is the ability to be a storyteller, and the chance to go explore the parks is a great way to see how current stories are being experienced and even inspire you to create new ones. Many people would agree that one of the most important components of the Disney College Program is the chance to network. Over the past semester I had the chance to take part in a Marketing and Sales seminar, which taught me a lot about how campaigns are put together and why they are created certain ways. We took a look at various marketing strategies, got to brainstorm some ideas and campaigns of our own, and even had the chance to meet with a panel of experts from Disney’s various marketing departments. I’m also getting the chance to network at my work location, as some of my leaders have connections with other Cast Members in the design/advertising field. With a role like merchandise, I’ve even had a chance to pick up shifts at other locations across property, and meeting co-workers and leaders at other locations has helped to increase my contacts even further. Overall, I am having so many memorable and rewarding experiences as a part of this program. The chance to create magic and memories for other people while also reaching toward my own professional goals is an experience that I will always be grateful for. I can’t wait to see what is in store for me as I complete the rest of my program through August!